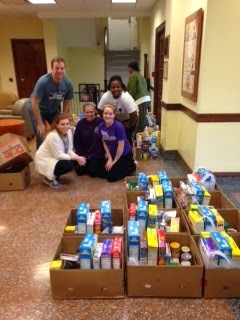 For the 16th year, students from JMU made the 21 hour trek to Kansas City to work at Sheffield Place. These engaged, hard-working students could have been in warm, sunny places like many other students on spring break, but they chose to come to Kansas City and learn about the crisis of family homelessness. I have learned so much about how to talk to children through the examples of the teachers in Project HOPE. Not only was I impressed with the treatment of the children, but also with the efforts towards building parenting skills with the moms. Playing and interacting was my favorite part of the week. The children have so much joy and happiness and a whole lot of energy! At Sheffield Place, you see these individuals who have such beautiful souls and realize that they are no different from any other person. These mothers have come so far and are working on a better life. In the afternoon, I spent time with the most fun-loving kids I have ever met. Knowing what they have gone through and what they may have seen amazes me how they can still get up every morning and be happy . . . . everyone who works here is truly passionate about making a difference for these families. Everyone at Sheffield Place displayed joy through the entire week and it took me by surprise. They always looked for the positive side of things and showed me that I needed to be more thankful. I now want to learn more about the substance abuse prevention side of social work. This facility is an inspiring and beautiful example of how to create a community of support with and environment of hope and empowerment . . . Each family here has a touching story of resilience and strength and I learned so much from them. 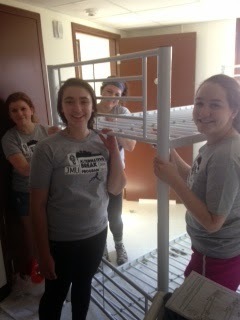 A lot of us have really learned about the intentionality that Sheffield Place has in everything they do. From a specific lingo of treating everyone with respect and dignity with each word to to the specificity of treatment plans for each family.